Digital transformation is the progressive shift of activities and relationships from offline to online. On the web, many different channels find space and, as a result, so do millions of users and brands alongside their content. In short, digital transformation is not something that companies need to do. It is already happening. This is the moment that companies must equip themselves to face an outlook in which global competition is intensifying and the success of one brand over another lies increasingly in the hands of the final consumer. collection of insights regarding their interests. Which tools are we talking about? DAM, that centralizes and organizes digital content, allowing it to be found easily and shared with colleagues. CRM, that manages the company contact database, allowing customer relationships to be maintained and monitored, intervening to improve them where necessary. DOCUMENT MANAGEMENT, to collaborate on documents or group work and supervise the progression of team projects. E-COMMERCE, to trade goods and services entirely online, managing buying and selling through dedicated platforms. ELECTRONIC INVOICING, a system that allows for paper to be abandoned and invoices to be created, issued and managed in digital format. I have only mentioned a few examples, but the list could go on. By using any of these systems, companies are certainly becoming more digital, but the future is made up of speed, intelligence and efficiency. It will be increasingly necessary to be able to manage greater complexity with less effort. Therefore, it is becoming imperative to abandon different solutions for different channels whenever circumstances allow. And this is where Content Intelligence solutions, dedicated to content, come into digital transformation technologies too. Very recent and not very widespread, they are, however, among the most powerful. As well as being compatible with any technology that is already in use (a CRM system, for example), they often integrate DAM solutions, but also artificial intelligence, delivery and process management (workflows). What does all this mean? Won’t the centralization of all these functions create greater complexity in use? Not at all. 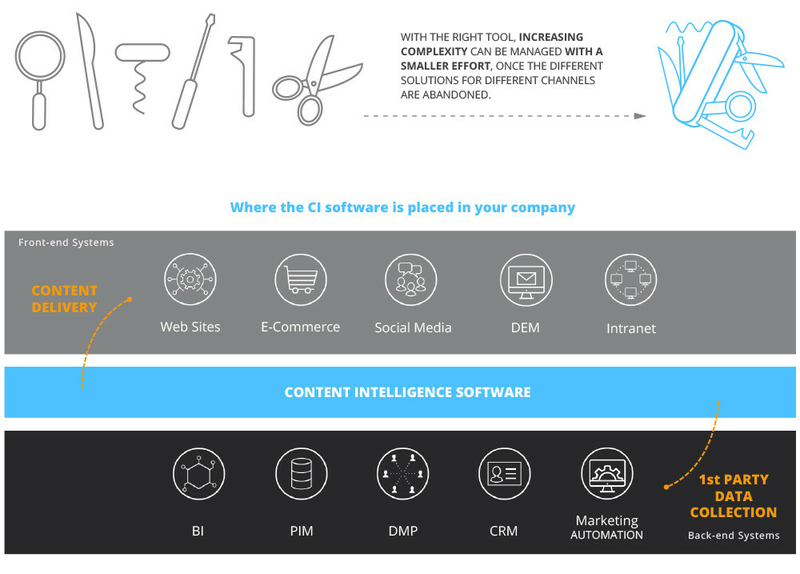 Content Intelligence platforms manage their own content like a DAM solution, but, thanks to the delivery option, they transmit it on corporate channels. In this way, they enable its distribution to be managed and its diffusion to be controlled. For example, it is fundamental to know whether the images of your products are being used suitably and consistently by all retailers, otherwise there will be a loss of credibility and damage to your image as far as consumers are concerned. Companies that have a well-defined brand identity, in particular, cannot allow this to be altered, even if it happens in good faith. I remember a digital marketing manager saying to me once: “You have no idea of the damage I’ve seen being done by people with an image of a helmet at their disposal, Paint and lots of goodwill!”. With a Content Intelligence solution, this could never occur, because the image is contained in the software and managed centrally by a manager. Integrated delivery allows for manual steps to be removed, where these kinds of unauthorized elaborations may occur. Sticking with the photo theme, CI software also integrates the workflow management functionalities for content, in such a way that it follows a predetermined creation process and is officially approved. Once processes have been streamlined, useful data can start to be collected. That’s right, straight away, without having to exacerbate the technical workload for their management: it is the software that elaborates them. How does it work? Content Intelligence collects and aggregates all the data, so that it becomes a single source for data analysis on content and users. This is how, therefore, the information that is already present in the CRM is further enriched, with the data concerning what the user has seen in your online areas. In this way, the brand gets closer and closer to the customer. It understands them, knows them, finds out what their interests are and what they absolutely do not want to see or read. This information may have a positive influence on the management of other tools, such as the e-commerce platform. It is an important aid in moving from being a product-centered company to being customer-centered. This is the key reference point: not focusing so much on digital transformation, but taking advantage of it in order to choose the right tools to use to strengthen relationships with people, which, even before digital, were one of a company’s greatest assets. Getting the user involved is fundamental in gaining their loyalty and Content Intelligence allows for them to be monitored at all the various stages, from their acquaintance until the moment in which they become a brand ambassador.